The residents of House District 13 finally have a representative in Juneau. Rep. Sharon Jackson, R-Eagle River, was finally sworn in today, the third day of the legislative session, after a broad majority of representatives agreed to select Rep. Neal Foster, D-Nome, as the temporary speaker of the House. Foster was elected on a 35-4 vote and his first—and only—order of business on Thursday was to seat Jackson by officially accepting Gov. Michael J. Dunleavy’s letter nominating her to fill the vacancy. House Republicans approved of her nomination, as is required by law. Jackson was escorted to the floor, where her oath of office was administered, before embracing legislators from both parties. After that, the House gaveled out for the day as Rep. Foster’s powers as temporary speaker remain very limited. The position is meant to essentially serve as a transition from the lieutenant governor to the election of the permanent speaker, but the House still remains at an impasse. Jackson brings the numbers of the party-line House Republicans to 20, a vote short of the 21 needed to secure a majority by electing a permanent speaker. If those Republicans hope to win another member over, they’ll need a member from the remnants of the Alaska House Majority Coalition—where 10 moderate and coastal members have already pledged to stick together—or to win back Rep. Gary Knopp, who departed the caucus in hopes of forming a truly bipartisan coalition. Knopp departed the Republican caucus out of fears that it couldn’t stick together through the session, alluding to the antics of Rep. David “Twice Censured” Eastman and the power he (and any other member) could wield over the 21-member majority. Eastman’s actions over the past few days would seem to support those claims. The legislator whose 75 solo “no” votes cast during the 30th Legislature earned him the moniker of “39-NEASTMAN” nearly scuttled negotiations on Wednesday when he orchestrated a stunt to have Jackson sworn in by a deputy law clerk across the street from the capitol. It was a move that was quickly recognized as illegitimate under Alaska law and publicly rebuked by the head of the 20-member Republican “Majority,” Rep. Dave Talerico. The negotiations held, however, and the House returned today to elect Foster as the temporary speaker, but even that wasn’t met without a last-minute stunt by Eastman. Lt. Gov. Kevin Meyer took nominations for speaker pro tem—Foster’s nomination as well as a nomination for Big Lake Republican Rep. Mark Neuman (which failed 20N-19Y)—but before the votes were taken, Eastman made a motion to waive the Legislature’s rules so Jackson could take part in the selection of the temporary speaker (which was only taking place in order to seat Jackson). Meyer ruled the motion out of order. Eastman appealed the ruling, which lead to the first of the 31st Legislature’s NEASTMAN votes. The House is set to return at 1 p.m. Friday. 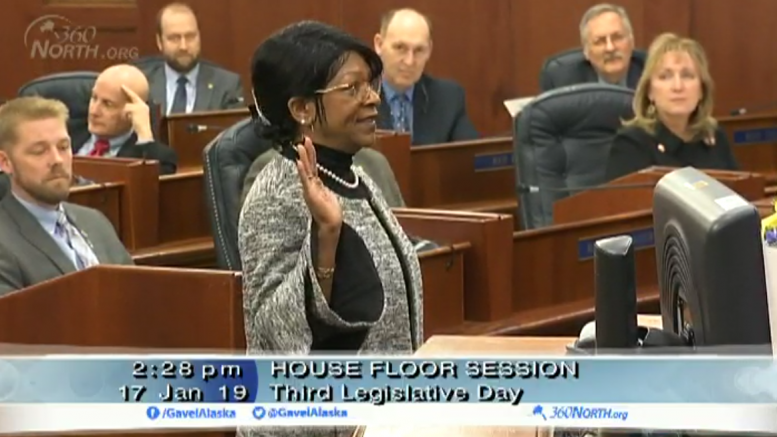 5 Comments on "Rep. Sharon Jackson sworn in to Alaska House, but not without one last stunt by Rep. Eastman"
You can lead if you get the lead out, but you can’t be Pb, even if being led to the smelter.. If having the residents of HD13 represented in this vote was so important, maybe Nancy Dahlstrom shouldn’t have quit before she even started the job. She’s the one who left them unrepresented. It’s telling that Eastman’s constituents aren’t bothered by his Messiah complex. No Matt, I’m amazed you would lie and tell people that what he did was illegal when clearly what the House did was illegal. The law is on his side. It’s sad that you don’t point out to people how the House is the one that broke the law. Why do they get a pass?